The premise of this one is that a global effort is underway to translate ancient writings that have recently been discovered. The researcher in Budapest has gone silent, and Professor Alan Whitmore is sent from Dallas to make sure the work gets completed. As soon as he arrives, Whitmore stumbles into a web of intrigue. The translation effort has attracted the attention of a secretive and deadly group known as the Weavers. To finish the translation, he’ll have to uncover the same dangerous facts that led to his predecessor’s death. It’s the makings of a good thriller, especially when the Weavers start deploying large spiders. It’s a spider-deploying portable enticement ball. Unfortunately, it’s better in concept than in execution. It’s possible for four writers to turn out a decent script — the 1959 Oscar for original screenplay went to Russell Rouse, Clarence Greene, Stanley Shapiro, and Maurice Richlin for Pillow Talk — but it’s not generally a number that inspires confidence. It’s especially troubling when the biggest credit among the lot of them is for co-writing The Mountain of the Cannibal God . The biggest problem is that it’s dull. There’s a lot of walking around, which is never very interesting in itself. There are confusing conversations, heavy in implications yet light in substance. Above all, there’s no compelling reason given for Whitmore to continue his investigation alone. We see in the opening moments that a childhood incident has left him terrified of spiders, so why does he not at least report back to Dallas as soon as things go all webbed and murdery? Whitmore’s tragic backstory has no bearing on anything. None of this is helped by the usual Italian horror feature of marginal voice dubbing. The practice saves time in filming because shots are never ruined by the sounds of passing vehicles or general human activity. Yet the attempt to sync the voice acting with the filmed lip movements seems to take precedence over actually using the voice to act. This is a particular problem when the films are intended to be in English and some of the actors don’t know the language. Then you have one person mouthing an approximation of the dialog and another trying to fit the words to it. It’s not so bad in an undead gore-fest, but it doesn’t whet the edge of suspense. No ghouls. Just a spider lady with a knife. 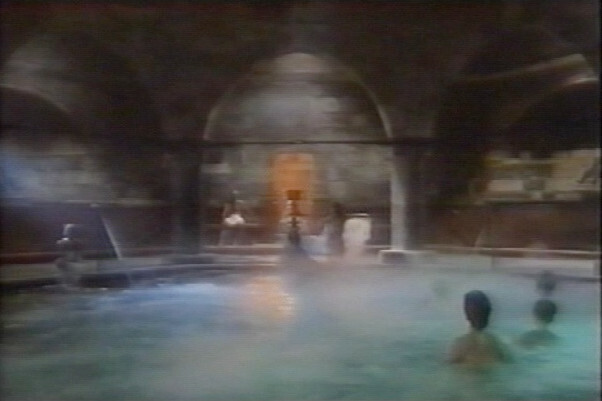 Lush visuals are one of my favorite features of Italian horror. The vibrant colors, captivating set pieces, and precise shot composition of classics like Suspiria and Blood and Black Lace give the movies a stylish presentation that is both artificial and grounding. 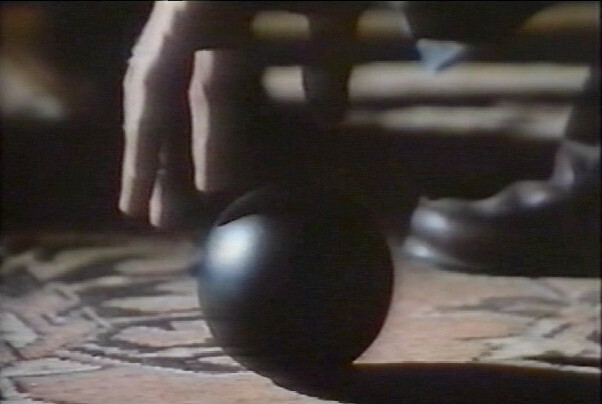 They take place in an abstracted reality, where such outrageous events can occur. While The Spider Labyrinth lacks nearly all of this (there is happily one murder that takes place among a maze of white sheets), it doesn’t exactly want for visual interest. The locations are gorgeous, even through the grainy murk of the DVD transfer I watched. Whether above-ground on the streets of Budapest or in the ancient sewage tunnels below, the city’s gravity saturates the film. During the dullest parts of the story, there’s usually at least something to look at. Architecture, stonework, drapery, rotting corpses — it’s a rich environment for an ancient cult to infest. Sitting around in a pool never looked so good. The visuals of most interest to this site, of course, are the spiders. There are a few tarantulas, which don’t really have a lot to do with anything. They generally appear whenever Whitmore is hiding in a wardrobe, which would be a terrific reason to stop doing that. It’s unclear whether the first occurrence, when Whitmore was a child, merely left him traumatized or marked for a spidery destiny. There are more interesting spiders that emerge from black eggs that the cultists leave near their enemies. These eggs are roughly the size of bowling balls, and the spiders are maybe as large as a rabbit (including the leg span). These are brought to life through stop motion animation, and while not exactly convincing they are pretty unnerving. You will know the cultists by their spider-shaped scars. 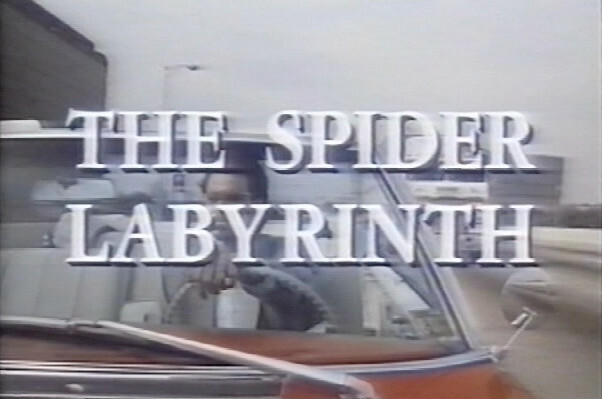 That would be enough for most movies, but The Spider Labyrinth strives for more. The cultists are were-spiders, possessed of great strength in their monstrous form and able to create webbing. They also sprout a mouthful of goofy-looking fangs, which is delightfully awful. Prosthetic effects are not the highlight of the feature. Luckily, there is yet another layer of spidery madness. This qualifies as a spoiler, but in my mind it’s the kind of reveal that would make someone want to see this. The Weavers worship a spider-human hybrid, and it’s pretty horrific. What looks like a mummified child lowers its head to reveal spider eyes. Then legs burst out from its stomach. 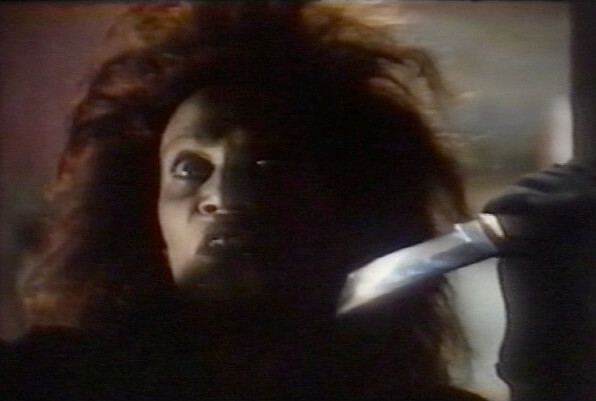 It’s a startling sequence, grotesque and unexpected, and it catapults the film into the realm of Lovecraftian horror. Certainly our hero gibbers when he discovers the truth. I wish I liked this one more than I do. The story is great, and the spider content is largely spectacular. There’s just so much meandering that I can take, though. A film like The Wicker Man handles the spiral of self-dooming investigation well, giving Sergeant Howie leads to guide him ever downward. Here, Whitmore mostly wanders around, not so much chasing as getting himself good and lost. He is, after all, in a labyrinth. There’s no clear direction, just a lot of paths that go nowhere.